Whether you are building, renovating or purchasing a new home, proper weatherization and insulation of your new home can save you up to 40 percent on your heating and cooling bills. If you know what to look for in your attic, basement or crawlspace, around windows and doors and around the exterior you'll be surprised how easy it is to maximize your home's efficiency. 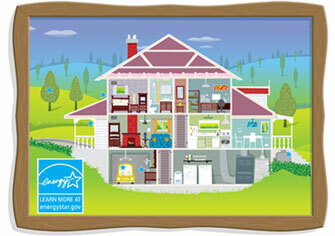 Take a room-by-room tour with the ENERGY STAR @ Home Tool and learn what you can do this summer to save energy, money and create a healthier home environment. The attic is one of the places where you often find the biggest air leaks, which can increase your energy bills and make you uncomfortably hot in the summer and cold in the winter. Since your attic is usually accessible, this can be a do-it-yourself project to seal and insulate your attic to improve your home's overall energy performance and comfort. Before you start to add insulation make sure that you seal all plumbing vents, ducts, electrical wiring and chimney flues. You also want to make sure that attic and gable vents aren't blocked to ensure proper ventilation. This will keep your roof cool and dry, extending the life of your shingles and creating a more balanced attic temperature. In your basement a common area for air leakage is along the rim joist which is the area where the cement top of the basement wall meets the wood frame. You'll want to use expanding foam or caulk to seal this gap as well as areas where pipes and wires go through the basement ceiling to the floor above. Make sure your basement windows are all caulked properly. Some simple ways to weatherproof your main living spaces are to make sure that all vents and registers are well sealed where they meet the floors, walls and ceilings. This is a common place to find leaks and disconnected ductwork. Make sure that floor vents aren't blocked by furniture otherwise your HVAC units will have to work harder to heat or cool your home. If you have a fireplace, you may want to plug the flue in the warmer months so that cool air doesn't escape. When it comes to your homes exterior, make sure you caulk wherever you find electrical, telephone, cable, water lines and dryer vents. Typically you'll find small gaps from normal wear and tear, but if you come across larger gaps you'll want to use fiberglass insulation. Caulk and weather-strip around your windows and doors. If your home is older, you'll want to add this to your yearly home checklist. It's a good idea to have a home energy audit done on your new or existing home to see which areas of your home are using the most energy so you can make the necessary adjustments to reduce your energy use. Since the leading cause of energy loss comes from improper insulation and air leakage, you will need to work closely with your builder to ensure you use the right insulation for your home. Keep in mind that the amount of energy you conserve will depend on several factors — climate, the size and shape of your home, your living habits and the type of HVAC equipment you select.